I often cruise the information highway, also known as the internet, and occasionally I come across a gem. Recently, I stumbled onto a blog called Law of the Lands – Farm, Energy and Enviro Law. 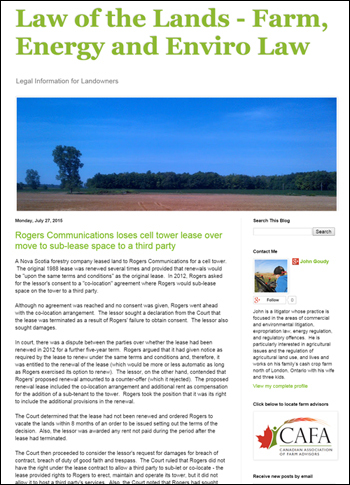 The sub-title is Legal information for Landowners. The site contains information about court decisions, changes to regulations, and other information pertaining to agricultural land use. Articles are posted by date and new information is frequently added. The search option works very well – for example, when I typed in “monetary”, I received a long list of links to articles on the Administrative Monetary Penalty System (AMPS), including an article entitled “A draconian administrative monetary penalty system”. Sound familiar? This article refers the federal Agriculture and Agri-Foods Administrative Monetary Penalties Act. In April, we alerted our subscribers about a similar program being considered at the Provincial and Municipal levels. Apparently, according to another article on this blog, AMPS were created in July, 2012 as part of the Government’s omnibus budget bill. From November 2014, an article tells how the municipality of West Grey was ordered to change its by-laws and grant permits required for construction of a wind farm. A search on wind turbines reveals another large list of court decisions on various aspects, including a judicial review application of the requirements for wind turbine setbacks included in the Ministry of the Environment (MOE) Noise Guidelines for Wind Farms. This blog is well worth a look for anyone interested in legal information related to agricultural land use.